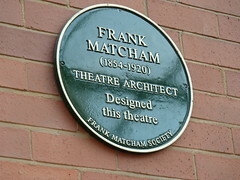 Frank Matcham (22 November 1854 – 18 May 1920) was an English theatrical architect and designer. 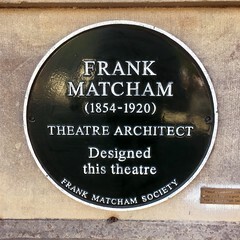 He was known for his designs of many British theatres including those of the Moss Empires group and in London the Hackney Empire (1901); the London Coliseum (1904); the London Palladium (1910) and the Victoria Palace (1911). 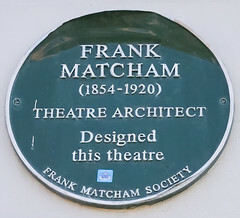 Born in Newton Abbot, Devon, Matcham was apprenticed to the architect, George Sondon Bridgeman, before moving to London where he joined the architectural practice of Jethro Robinson, who was at that time consulting theatre architect to the Lord Chamberlain's office. 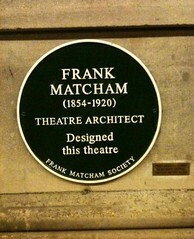 He completed his first solo design of the Elephant and Castle theatre which opened in June 1879. Between 1890 and 1915, Matcham helped train, Bertie Crewe and W.G.R. 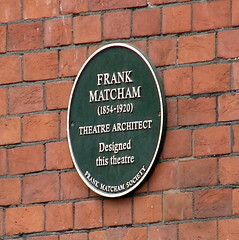 Sprague, and all three were responsible for the design and construction of over 200 theatres and variety palaces in the United Kingdom. 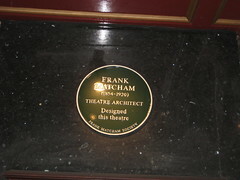 Victoria Quarter was begun in 1900 with the opening of Frank Matcham's splendid Country and Cross Arcades. Enhanced in 1990 by covering Queen Victoria Street, the site was formerly medieval yards, Georgian shambles and slaughterhouses. 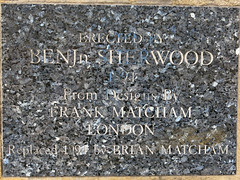 Erected by Benj'n Sherwood 1984 From Designs By Frank Matcham London. 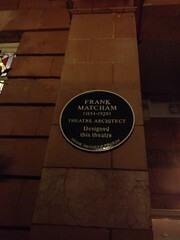 Replaced 1994 by Brian Matcham. Winter Gardens (Grade II Listed). The Blackpool Winter Gardens were first opened to the public in 1875 and the Pavilion and ancillary buildings designed by Thomas Mitchell were officially opened to the public by the Lord Mayor of London in 1878. Many subsequent additions to the original buildings took place and principal amongst these are the Empress Ballroom designed by Manghall and Littlewood - opened in 1896 and the Opera House designed by Charles McKeith - opened in 1939. 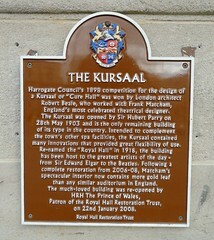 The latter is the third Opera House to be built on this site. 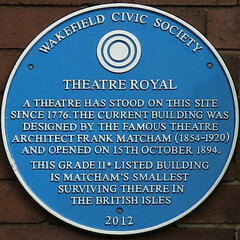 The original was the first building in Blackpool to be designed by the celebrated theatre architect Frank Matcham and was opened in 1889. In 1978 the Winter Gardens and Opera House were refurbished by the First Leisure Corporation plc, who employed David Quigley as the architect for this work.